Columbine are members of the buttercup family. The plant can grows at elevations between 3000 - 11,000 feet in usually along streams and washes in moist, sandy soil, in shady forests. The columbine grows to about 4 feet in height and has dark green leaves. Leaves grow to 1 ½ inches in length. 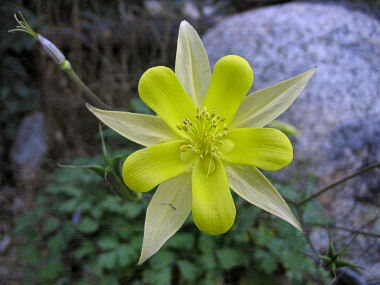 The Yellow Columbine blooms between April and September, and produces a bright yellow flower. The flowers have 5 petals which grow to 3 inches in width and have 2 inch long spurs which project backwards (though you can't see these in the photo). 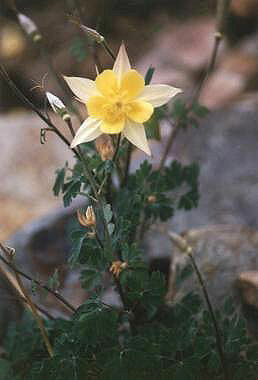 This columbine was photographed near the summit of Mt. Lemmon.